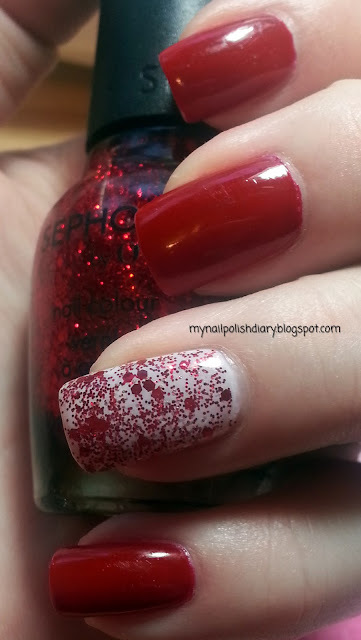 China Glaze Ruby Deer with Essie Marshmallow and Sephora by OPI Be-Claus I Said So accent nails. 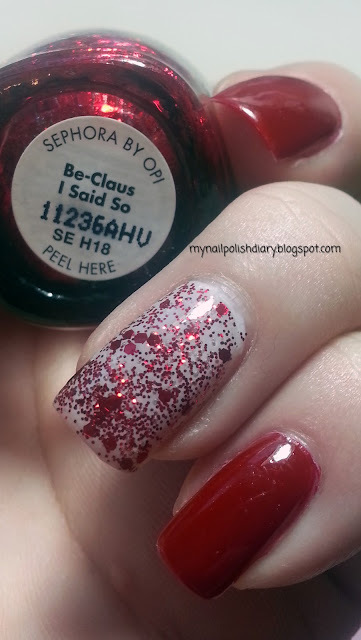 I bought $OPI Be-Claus I Said So when it was released LAST Christmas (2011), but I am just now using it for the first time. So glad I finally wore it. It's gorgeous. Love is as much as I thought I would. I used Essie Marshmallow, core collection, for underwear. It really made the red glitter pop. China Glaze Ruby Deer, 2010 Tis The Season to be Naughty and Nice, is a pretty red that I know I have dupes of. I just keep buying these reds. I love how they look with my skin tone.